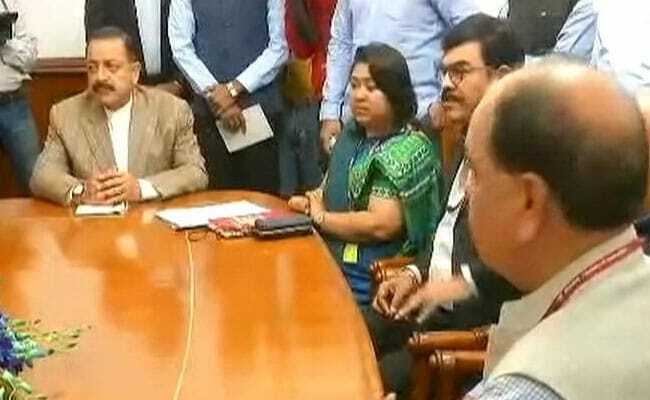 New Delhi: Escalating their protest against the alleged assault on Delhi Chief Secretary Anshu Prakash, a delegation of Indian Administrative Service (IAS) officers today met Minister of State in the Prime Minister's Office Jitendra Singh. Mr Singh is also in charge of the department of personnel and training, the cadre controlling authority of IAS officers. This comes on a day police searched Chief Minister Arvind Kejriwal's house to question his staff and recover footage of the alleged assault. A top bureaucrat today resigned as a member of the state advisory council of education in support of Mr Prakash who claims he was assaulted by some AAP lawmakers in Mr Kejriwal's presence at a meeting held at the chief minister's home on Monday night. At the meeting, the IAS officers wanted the government to ensure they are protected while discharging their official duties. They later said the centre had assured them of all possible help as per the law. "We should give them a work-friendly environment. We should get the best out of our officers in the interest of the nation," said Mr Singh after meeting the IAS delegation. Around 200 IAS officers have resolved that they would not attend meetings called by the chief minister and his cabinet colleagues till Mr Kejriwal apologises for the alleged assault. The officers have said they would maintain written communication with the ministers so that public services are not disrupted. "We are government employees, not affiliated to any political party. We have been deeply hurt by what has happened," said Manisha Saxena, secretary of the IAS association said after meeting the centre today. Retired IAS officer Dheer Jhingaran today resigned as advisor to State Advisory Council of Education as a mark of protest against what he called the "reprehensible" assault on Mr Prakash. "Don't want to associate myself further with a government that treats senior officers in this manner," he said. The Aam Aadmi Party (AAP) has strongly reacted to today's police search at Mr Kejriwal's home, calling it "dadagiri" or hooliganism. Reeling off statistics on rapes, murders and dacoities in the national capital, the party asked what the police was doing to control crime. Two AAP lawmakers, Prakash Jarwal and Amanatullah Khan, have been arrested over the alleged assault. AAP claims it is being "hounded", adding that there is no evidence to back up Mr Prakash's claims. Mr Prakash says he was attacked at Monday's meeting called to discuss difficulties in the release of some television advertisements relating to completion of three years of the AAP government. In an embarrassment to AAP, Mr Kejriwal's aide VK Jain reportedly told a court yesterday that he had seen AAP lawmakers assault the chief secretary. In his statement recorded before a magistrate, Mr Jain, who is a retired bureaucrat, said he had gone to the washroom during the meeting and when he returned he saw two lawmakers hitting Mr Prakash.